Kelley Lake’s cafeteria brightened by DeKalb grads. As students at Kelley Lake Elementary returned to school on January 4, 2018, they were greeted by such famous faces as LEGO Batman, the Power Puff Girls, Gumball Watterson, Darwin Watterson and more*. “Hurry! It’s Pizza Day at Kelley Lake,” exclaims Gumball. “Batman, don’t forget your lunch!” shouts another character, as Batman swings over a city skyline and into Kelley Lake’s cafeteria. The famous fictional characters arrived at Kelley Lake by way of an eye-catching, vibrant and kid-friendly mural installed in the school’s cafeteria over Winter Break 2017. The three artists behind the mural—Tommie Hines, Latoya Thomas and Victor Walker—are former DeKalb County School District (DCSD) students that jumped at the chance to give back to their local community. 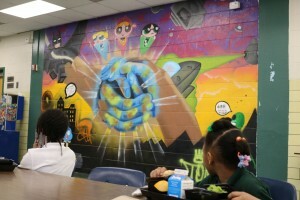 Hines, Thomas and Walker are graduates from McNair Middle and High schools who share a passion for creativity. Hines’ son also attends Kelley Lake. 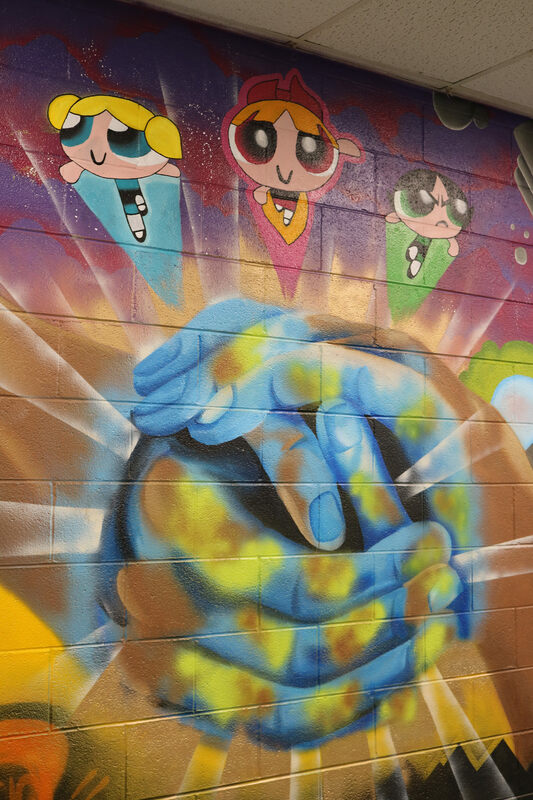 While the mural prominently displays cartoon characters, the mural’s focal point is meant to inspire. In the center, two hands clasp together to create a shining and light-emitting globe. 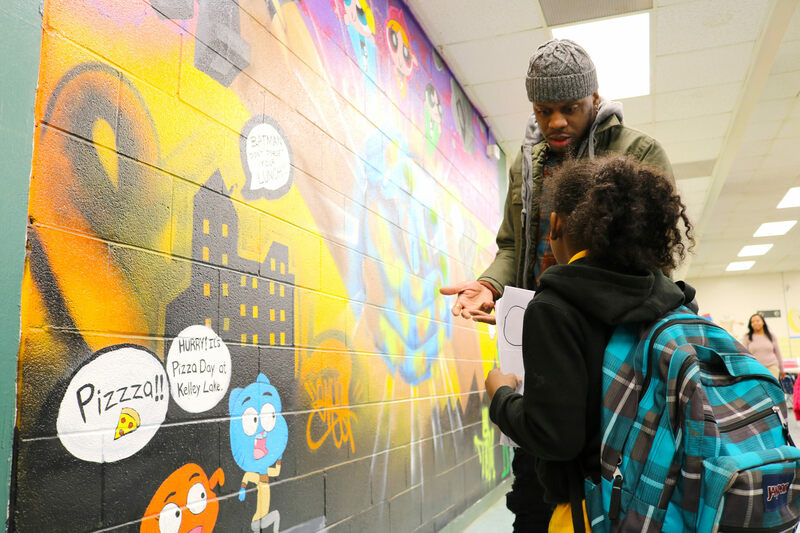 Hines, Thomas and Walker greeted students on Jan. 4 to celebrate the mural, gauge student reactions and offer tips to aspiring young artists. 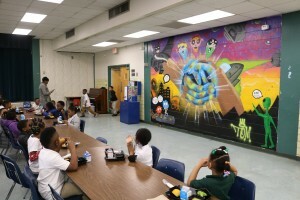 Kelley Lake Principal Peggy Davis said she hopes the mural inspires students to embrace their artistic skills. Davis said plans to have Hines, Thomas and Walker decorating other walls at Kelley Lake are already underway. *LEGO Batman, the Power Puff Girls, Gumball Watterson and Darwin Watterson are trademarked and copyrighted characters.